Since 9/11, the United States has spent $15 billion in Pakistan, mostly on military support, and today Pakistan is more unstable than ever. In contrast, Bangladesh, which until 1971 was a part of Pakistan, has focused on education in a way that Pakistan never did. Bangladesh now has more girls in high school than boys. (In contrast, only 3 percent of Pakistani women in the tribal areas are literate.) Those educated Bangladeshi women joined the labor force, laying the foundation for a garment industry and working in civil society groups like BRAC and Grameen Bank. That led to a virtuous spiral of development, jobs, lower birth rates, education and stability. That’s one reason Al Qaeda is holed up in Pakistan, not in Bangladesh, and it’s a reminder that education can transform societies. 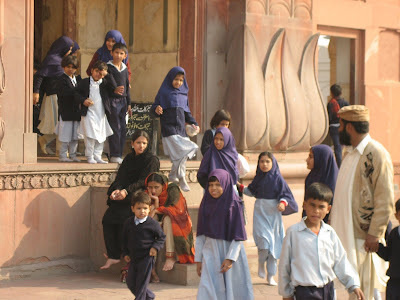 When I travel in Pakistan, I see evidence that one group — Islamic extremists — believes in the transformative power of education. They pay for madrassas that provide free schooling and often free meals for students. They then offer scholarships for the best pupils to study abroad in Wahhabi madrassas before returning to become leaders of their communities. What I don’t see on my trips is similar numbers of American-backed schools. It breaks my heart that we don’t invest in schools as much as medieval, misogynist extremists. For roughly the same cost as stationing 40,000 troops in Afghanistan for one year, we could educate the great majority of the 75 million children worldwide who, according to Unicef, are not getting even a primary education. We won’t turn them into graduate students, but we can help them achieve literacy. Such a vast global education campaign would reduce poverty, cut birth rates, improve America’s image in the world, promote stability and chip away at extremism. Education isn’t a panacea, and no policy in Afghanistan is a sure bet. But all in all, the evidence suggests that education can help foster a virtuous cycle that promotes stability and moderation. So instead of sending 40,000 troops more to Afghanistan, how about opening 40,000 schools? On the surface this seems right, but it is very wrong. Americans have the view that Pakistan is full of terrorists and people who take money from the U.S. and make no good use of it. There is some truth to this I assume, but Pakistan is also full of very reasonable and intelligent people who behave a lot like people in the US. They go to good schools in Pakistan, they run successful business there, and they worry about fixing their country. I have been to Pakistan a few times, always talking about education and am usually very well received. I have talked with Mushareff and with various ministers in the government on many occasions. I am on the board of a private school there that is trying very hard to make great and innovative schooling available around the country. What is the issue here? The issue is indoctrination. Madrassas have a goal. Their goal is make the kids that attend them believe certain things that the teachers are sure is true and to think and behave in certain ways in their every day lives. In short, Madrassas, like many other religiously run schools, know what the end product should be and they have a long history of being successful in creating what they want. The fact that we don’t like what they produce is irrelevant. lives reasonably nor help them to make a living. The education they receive is all about getting them into college, which is pretty irrelevant for the majority of the students who just need to be able to function well after graduation. help Mr. Kristof. You actually have to understand the difference between education and indoctrination. Madrassas do it and the U.S. schools do it too. You are saying that we should indoctrinate Pakistani students with our kind of indoctrination. I say we should consider what learning is really about is, help our children learn things that are, or will be, important to them. (This would not include say -- our indoctrination about the significance of Algebra or the wonderfulness of our glorious history.) Build a school that does that, use it to help our own children learn, and then export that. We have all gone to school. We all know that school is organized around academic subjects like math, English, history and science. Why? It is not easy to question something that everyone takes for granted. It is especially not easy when the very source of all our concerns in education can be easily traced to this one decision: to organize school around academic subjects. How else might school be organized? There is an easy answer to this: organize school around thought processes. In 1892, when the American high school was designed, we didn’t know much about thought processes. Now we do. It is time to re-think school. All of these processes are part of a small child’s life as well as a high function adult’s life. Education should mean helping people get more sophisticated about doing these things through the acquisition of a case base of experience. Teaching should mean helping people think about their experiences and how to handle these processes better. Unfortunately education and teaching rarely means either of these things in today’s world. Millions of Americans are trapped at the margins of the economy because they lack the basic skills that come with a high-school education. This year, more than 600,000 of these people will try to improve their prospects by studying for the rigorous, seven-hour examination known as the General Educational Development test, or G.E.D., which should end in a credential that employers and colleges recognize as the equivalent of a diploma. The most fortunate live in states — such as Delaware, Kansas and Iowa — that have well-managed programs in which 90 percent or more of the test-takers pass. The least fortunate live in New York State, which has the lowest pass rate in the nation, just behind Mississippi. Worse off still are the G.E.D.-seekers of New York City, which has a shameful pass rate — lower than that of the educationally challenged District of Columbia. This bodes ill for the city, where at least one in five adult workers lacks a diploma, and the low-skill jobs that once allowed them to support their families are dwindling. Which of the following political actions violated the principleof “unalienable Rights” of liberty that evolved from the above excerpt of the U.S. Declaration of Independence? 1. In 1857, a U.S. Supreme Court ruling promoted the expansion of slavery in U.S. territories. 3. In 1920, the Nineteenth Amendment to the Constitution granted women the right to vote nationwide. 4. In 1964, the Civil Rights Act outlawed racial discrimination in employment and public accommodations. 5. In 1971, the Twenty-sixth Amendment to the Constitution extended the right to vote to 18-year-old citizens. A cook decides to recover some table salt that has been completely dissolved in water. Which of the following processes would be the most effective method of extracting salt from the solution? In May, I graduated from Prince William Community College. Graduating with an associate of arts degree in horticulture. Which is the best way to write the italicized portion of these sentences? If the original is the best way, choose option (1). I don’t’t know about you, but as an employer I know that I would certianly hire people for low paying jobs if only they could answer these important questions. Perhaps it is time for the Times to notice that employers won’t hire people who can’t do anything useful and that our education system doesn’t teach much that is useful. Pouring money into test passing courses will fix nothing. New York will need to invest a great deal more than it spends at the moment. But the costs of doing nothing clearly outweigh those of remaking a chaotic and ineffectual system. Right you are Times. New York needs to invest in real eduation however, not in test prep courses. How is it that the Times is this much out of touch?